Make your way to the Recommend a Friend page, here you’ll find the referral form. Input your own details and those of your friend. Once submitted your friend will receive an email with the unique referral code. Have them enter this code when signing up for their new account. Ensure they spend over £15 on their first order to unlock your discount. Wait for or request your friend to email you with your unique referral code. Use this code when signing up for a new account on the WorldStores site. Place your first order, ensuring to spend over £15. 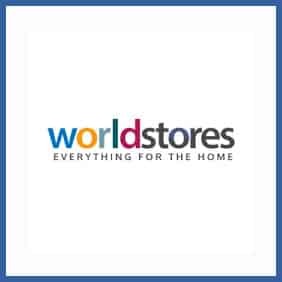 As the logo says, WorldStores really do stock everything for the home – oh, and the garden too. From beds and sofas to doors, garden furniture and nursery equipment. Whether you’re an existing customer or not you can split a £30 discount by referring a friend to the WorldStores site. Just fill out the email form and send it over – it’s limited to 3 successful referrals so choose wisely.